Walking 60 miles in 3 days seems daunting to anyone, but to one 80 year young woman it was a challenge she eagerly underwent. This woman is Lillian Williams, my grandmother. A wife, and mother of three boys, she has led a very active life. Now, at the age of 80, she is still amazingly active, and an inspiration to the rest of us. 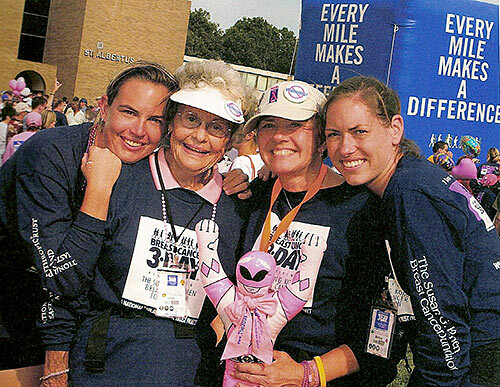 In 2003, Lillian's daughter-in-law was diagnosed with breast cancer. She and her son were coping with it quite well, when he died suddenly of a heart attack at the age of 57 in December of that year. Under those circumstances, her other daughter-in-law, Sue, my mother, approached her about participating in the Susan G. Komen Breast Cancer 3 Day. My mother and I had done five walks previously and found it to be not only an extremely rewarding experience, but inspiring and healing as well, and thought that it might do the same for Lillian. Agreeing that it would be a beneficial experience, Lillian set out on the path to the 3 Day. In preparation for walking 20 miles a day, Lillian started by following the suggested training schedule. She started walking 3-4 miles every other day. After 4 days of repeated mileage she would increase the distance. Nearing the event, she was walking just about everyday, sometimes 15 miles. It was important to her to properly train so that she would not only be able to reach the destination, but enjoy the voyage. There is not only a lot of training that goes into preparing for the 3 Day, but there is the requirement of raising at least $2,000 dollars as well. Lillian was worried about being able to meet the goal, but we assured her that it would be easier that she might think. Who wouldn't donate money to an 80 year old woman who was walking 60 miles in 3 days raising money and awareness for breast cancer? Not only did she meet the mark, but she actually raised over $3,000 dollars! While in Denver visiting her family, she was talking with her granddaughter Mary about the walk and inspired her to participate as well. We would be walking three-generations deep, and inspiring other generations to come, an inspiration that wouldn't stop there. During the walk, Sue posted a sign on her back announcing that Lillian was 80, and the response was overwhelming. While Lillian originally thought that she wasn't really doing anything amazing, that she was just walking, by the end she realized exactly what an amazing thing she had really done. People would stop her along the way and ask if they could have their picture taken with her, inspiring them to stay healthy so that they would be able to do these kinds of activities with their grandchildren. Raising money, and walking the 20 miles a day was not the only challenge she was faced with. Lillian had never been tent camping in her life and was about to spend both nights of the event in a two person tent, showering in semi-trucks, without the luxuries of blow dryers and curling irons. At one point during the first evening, I was looking for her to go to dinner, and one of the women suggested that "I look for her in the Congo line". Everyone was completely amazed at the amount of energy she had, regardless of her age. Towards the end of the evening we were reflecting on the day and I had alleged that maybe it was the stubborn German in her that pushed her on, to which she responded that it wasn't stubbornness, but tenaciousness, and that "tenacity is a virtue". I agree. I have always known that my grandmother was an amazing woman, who truly inspires me. Now I think that she has come to realize how just being who she is can be inspiring to so many others as well.